Thomas L. Friedman's no. 1 bestseller The World Is Flat has helped millions of readers to see globalization in a new way. Now Friedman brings a fresh outlook to the crises of destabilizing climate change and rising competition for energy-both of which could poison our world if we do not act quickly and collectively. His argument speaks to all of us who are concerned about the state of America in the global future. Friedman proposes that an ambitious national strategy- which he calls 'Geo-Greenism'-is not only what we need to save the planet from overheating; it is what we need to make America healthier, richer, more innovative, more productive, and more secure. As in The World Is Flat, he explains a new era-the Energy-Climate era-through an illuminating account of recent events. He shows how 9/11, Hurricane Katrina, and the flattening of the world by the Internet (which brought 3 billion new consumers onto the world stage) have combined to bring climate and energy issues to Main Street. But they have not gone very far down Main Street; the much-touted 'green revolution' has hardly begun. With all that in mind, Friedman sets out the clean-technology breakthroughs we, and the world, will need; he shows that the ET (Energy Technology) revolution will be both transformative and disruptive; and he explains why America must lead this revolution-with the first Green President and a Green New Deal, spurred by the Greenest Generation. 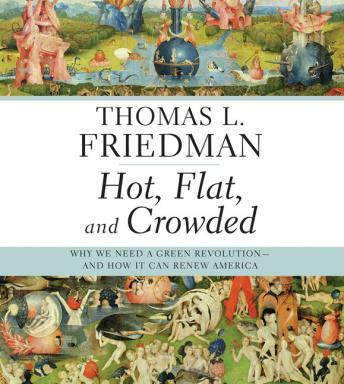 Hot, Flat, and Crowded is classic Thomas L. Friedman-fearless, incisive, forward-looking, and rich in surprising common sense about the world we live in today. A legitimate idea--but the unabridged version goes on and on and on ... and on. It is repetitive, repetitive, and more repetitive. In other cases the author's stores of his meetings with famous and powerful world figures would be off-putting, but at least that broke up the same idea presented again, and again, and again, and again--and yet again! The topic was interesting, but the reading was so slow I couldn't stand it, and I had to send it back and cancel the second set of disks. Very frustrating! It sounded like someone reading to kindergartners, although they would have been even more bored. I need something to keep me awake and interested on long drives, not something that sounds like bedtime stories. Does anyone know why some audiobooks are read so slowly? If it had been read at a normal rate of speed, I think they could have used half the disks. Producing this one at 1 and a half speed, or whatever they use for radio broadcasts, would have been even better. This book is a bit repetitive and preachy. Still, it causes you to think and may help to set a tone for government action on important energy issues. I am admittedly a huge fan of Friedman's. I read his column weekly in the NY Times, & I've read every one of his books. His last book is on my Top 5 list of books that I recommend to people. This book didn't disappoint either. It sets out to prove how tightly integrated the three topics are today - Hot (global warming / climate change), Flat (globalization), and Crowded (the rising global population). Friedman lays out exhaustive details on how this is a global problem, & the US's role in it. He also describes in exhaustive detail the steps he thinks the US, as well as the rest of the world needs to take to slow down / halt the catastrophic damage that we are doing to our planet, making ourselves next on the endangered species list. He goes into detail how the US needs to play a MAJOR role in TheGreen Revolution, and how ET (Energy Technology) is to the 21st Century as IT was to the latter half of the 20th. This book is a MUST READ!